The Lee-Fendall House Museum & Garden interprets American history through the experiences of those who lived and worked on the property from 1785 to 1969. As an educational center, the museum preserves its historic resources to promote community engagement about the relevance of the past to our present. 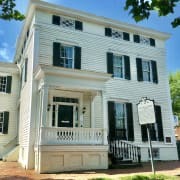 The Lee-Fendall House, located in Old Town Alexandria, Virginia, is a showcase of American history. Since its construction in 1785, the house has served as home to several generations of the Lee family (1785-1903), hundreds of convalescing Union soldiers during the American Civil War (1863-1865), the locally prominent Downham family (1903-1937), and one of our nation’s most controversial and significant labor leaders, John L. Lewis (1937-1969). Throughout its history, the home was also lived and worked in by generations of enslaved and free African Americans. Would you recommend Lee-Fendall House Museum? It was really fun. I spent most of the time picking up leaves, but I learned a lot about gardening and spent quality time with my dad. He helped as well. I also met a new person. She was cool.